Providing you the best range of bitumen extractor and sample extractor frame with effective & timely delivery. We are actively engaged in manufacturing and supplying an excellent range of Bitumen Extractor. 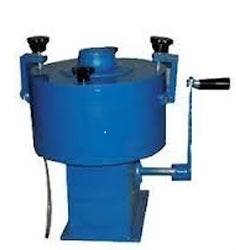 Offered bitumen extractor is manufactured by our professionals utilizing high grade factor inputs & leading techniques in conformity with quality standards. The bitumen extractor offered by us is well tested against assorted quality parameters in order to ensure its flawlessness. Also, clients can avail this bitumen extractor from us at market prices. 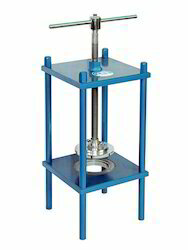 This Extractor Frame is used for taking out soil samples compacted or undisturbed, from 100mm diameter and 150mm diameter cylinder such as core cutters, Proctor moulds, C.B.R. moulds etc. Specifications : It consists of a 5 Ton capacity hand operated, hydraulic jack mounted on a suitable frame. Two plungers, one for 100mm diameter and the other of 150mm diameter moulds are supplied. One thrust plate for 150mm diameter and one for 100mm diameter specimens are also supplied. Height of thrust plate is adjustable. Accessories : Set of Plunger adapters and thrust plates for 38mm, 50mm and 75mm diameter specimen.